We probably don’t write as much about guitarist and singer Robben Ford as we should here, considering the nearly three dozen albums he’s put out over the years in both his own name and with a variety of bands. But it would be difficult to overlook his latest release Into the Sun (Mascot Label Group), which Ford himself refers to as “one of the top recordings I’ve ever done”. 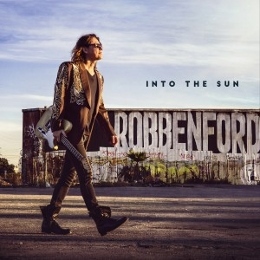 Featuring guest appearances from the likes of Keb’ Mo’, Robert Randolph, Warren Haynes, Sonny Landreth, ZZ Ward, and Tyler Bryant, Into the Sun is a pleasing mix of serene ballads – such as the jazzy, creeping “Rose of Sharon” that opens the album with its mellow vocals, subdued organ, and delicate guitar, and the smoky R&B sounds of the ZZ Ward duet “Breath of Me” – and infectious grooves, mainly the latter. That includes the breezy “Day of the Planets” with its lightly rocking chorus; the flowing, open road feel of the Booker T-ish “Rainbow Cover”; a funky “High Heels and Throwing Things” on which Allman Brothers Band member and Gov’t Mule frontman Warren Haynes contributes his share of nice licks; and the patient, swaying “So Long 4 U” with slide guitar master Sonny Landreth accompanying. But perhaps the best of the tracks here are a greasy, uptempo “Howlin’ at the Moon” – one of several tracks to employ some impressive female background vocals – and the slow rootsy shuffle of “Justified” that sounds like it was written just for bluesamericana artist Keb’ Mo’, with whom Ford in fact trades lines over some searing lap steel playing from Robert Randolph and excellent work on keys from Jim Cox. Cap that all off with the gritty, more rocking “Cause of War” with its distorted vocals and stinging guitar; the country-rock riffs and muddy harmonica (courtesy of song co-writer Kyle Swan) of the slow blues number “Same Train”; and a closing “Stone Cold Heaven” that features guitarist Tyler Bryant – not to mention a rather terrific band and some masterful guitar and crisp vocals from Ford – and you get a pretty good sense of just to what Ford was referring when he described the project as “really upbeat” and “hav(ing) a positive vibe to it”, with “a lot of different rhythms and colors”. Perhaps the only area where “upbeat” doesn’t ring entirely true is in regards to the album’s lyrics (this is, after all, the blues), even if they do happen to be generally well-done and often somewhat captivating (and mostly from Ford himself, with help only from Swan on a handful of songs and Ward on their duet). That said, for nearly every gem like “I come here with water/ your world is on fire/ and I’m met when the smoke clears/ with a screech of your tires / Rose of Sharon /why don’t you come on/ why don’t you come on home?” and “asked why so cold and cranky, you take a swipe at me/ ask any judge and jury, they’d pack you off and set me free/ and I’d be justified (I would be justified) to pack up my things and walk / well, I’d be justified (I would be justified), had enough of your crazy talk”, there are also plenty of positive sentiments along the lines of “tried to find myself, where I didn’t belong/ finally found real fire, in a secret song/ watching good things grow/ under the rainbow/ under your rainbow cover” and “the window opened on your face/ a single star, a timeless space/ to freely give is not so smart/ but I love the thief who stole my heart/ so close to you, you’re the very breath of me”. True to its title, this album from Ford is a shining one. Even if the guitar virtuoso plays only a fistful of the 11 tracks from Into the Sun during the shows on his spring tour (which, for our good friends here in BluesPowR’s adopted hometown of Pittsburgh, includes a stop this coming Saturday, April 18th at the Southside’s Rex Theater), that alone will likely give plenty to write home about. This entry was posted in Albums and tagged Keb Mo, Robben Ford, Robert Randolph, Warren Haynes. Bookmark the permalink.